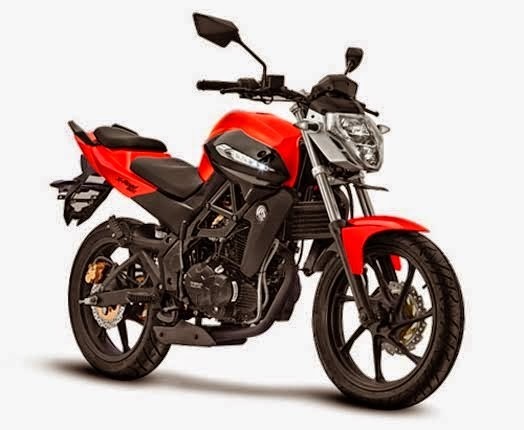 Minerva X-Road 150S Specifications - Minerva X-Road 150S is a sport bike low entry that comes with carrying a naked bike design combined with features modern technology that makes the Sport bike Minerva X-Road 150S looks more sporty and modern. Minerva X-Road 150S is equipped with an engine capacity of 150 cc oil cooled SOHC is juxtaposed with 5-speed transmission. The machine is capable of generating power up to 9.5 kW at 9,500 rpm and maximum torque of 10.5 Nm at 7,000 rpm. As for keeping the engine rotation remains smooth and no excessive vibration X-Road 150S equipped with engine balancer shafts which serves to keep the engine running at maximum performance.